We are wild about willow! What a thrill it is for us to be able to grow, harvest, dry, grade and soak our own willow and then use it to create beautiful crafts! We have participated in some exciting projects over the past few years...A huge installation at the Jardin Botanique in Montreal with international landscape artist Patrick Dougherty, some living willow school playgrounds, classes with English, Welsh and Danish basket makers, guest instructors here at our farm and a feature article in Le Lien Creatif by Bernard Bertrand. You can see some of these events and more on our Facebook page. DON'T HAVE THE SPACE OR TIME TO GROW YOUR OWN? Basketry willow for your home or school craft projects is available for sale, priced by length and weight. Purchase dried rods or pre-soaked* in ready to use lengths. Soaked willow should be used within a week or two of soaking, depending on the temperature. Please contact us to place an order for basketry willow. *pre-soaked willow is available for pick-up only and requires up to four weeks for soaking. Willow is a fast growing, versatile plant used for centuries by many cultures to build crab or lobster pots, a fascinating boat called a coracle, vessels for carrying and storage, furniture, biomass fuel, erosion control, windbreaks, shelters, hurdles, plant supports and sculptures. Did you know that willow is also used to make artists charcoal and pain relievers? Willows have been planted to clean up toxic waste sites by taking up chemicals and heavy metals from the soil and can grow under walnut trees because it is not effected by the chemical juglone that walnuts produce. There are hundreds willow or 'Salix' species of trees and shrubs and many hybrids, growing from 6cm to 20m in height. We grow approximately 30 varieties best suited to basketry and living willow projects. 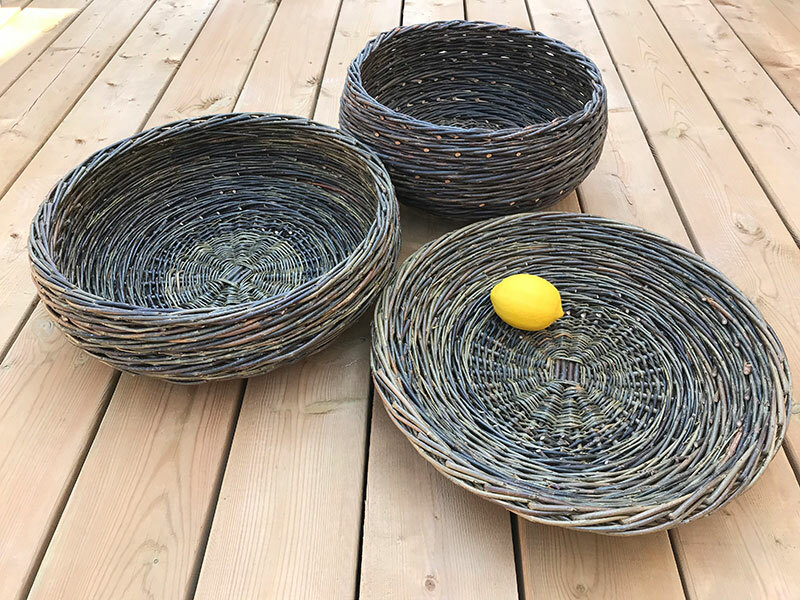 Willow is a wonderful material to work with, extremely strong but very flexible, it can be used either fresh (for living willow) or dried and rehydrated (for basketry). SOME OF OUR BASKETRY WILLOW VARIETIES CAN BE GROWN AS BEAUTIFUL ORNAMENTALS, WITH INTERESTING COLOUR FOR HEDGING, PRIVACY SCREENING OR WINDBREAKS. THESE CAN BE STARTED FROM RODS OR CUTTINGS. Most sites are suitable for growing willow, although it does prefer at least one half day of sun. Willow does not require a completely wet site, but it's best planted in an area with access to water for the first year or during drought conditions. In addition to kits for living willow projects, we offer bulk orders for rods and cuttings. Please contact us in early 2020 for planting in spring.